Next Saturday evening, myself & The Hubs are off to Taste of Dublin (again) for our annual works night out. Well, it's an excuse to eat lots, drink a fair bit and be very merry. We missed the first one because we were in London for himself's birthday but we've been to every one since... in fact last year, I navigated the hills and slopes of the Iveagh Gardens on crutches - it was a week after knee surgery and the crutches were very handy for shooing people out of my way. I also employed this technique the following night at Take That to great effect... whacked ankles for everybody! One of my friends has an automatic response when she hears the phrase Taste of Dublin - oh that's Baba's day out, as she mentioned to me last night. We went to see SATC2 in Dundrum and had dinner beforehand at Siam Thai. It was lovely - although still can't compete with the superb Vine in Wexford - but there were a few hiccups. The wine we chose was not available and the cute hoor waiter offered another (more expensive) bottle which actually wasn't as nice, so we changed to a lovely Chenin Blanc which was perfect. I only had a few sips because I was driving, but Ms. Fishy & Monkers drained the bottle quite happily! Another little hiccup was the presence of a long and lustrous eyelash on top of our bowl of rice. Nice. Thankfully a quick word ensured replacement and the rice was removed from our bill. SATC2 was much better than I had expected, although it's a sign of age when we were lusting after the wallpaper & furniture rather than the clothes (jesus, some of them were hideous!) and the cast could benefit from some soft focus lenses and a bit of face filler.. they're fierce gaunt. No fear of that happening to me!!! Another thing was the lack of food in the film - I think I only saw SJP eat twice in the film, although there were plenty of references to takeouts and restaurants... what a shame! Anyway, back to the topic of the day - Taste of Dublin. The Hubs has gone off to work, the house is spotless and I'm listening to the Ray D'Arcy Show live from the Cat Laughs rather than watching my beloved Saturday Kitchen. So that means I can pootle around on the laptop - i.e. 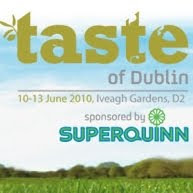 read the Taste section of the Irish Times magazine and delve into the various restaurant offerings at Taste of Dublin next week. We've found them to be a bit hit and miss in the past - some are exquisite and others aren't worth the little cup they're served in. Also, the prices haven't shrunk at all despite the nasty "R" word - a lot of dishes are priced at 8 florins for a teeny weeny portion. As we tend to try one of everything, some of the dishes amount to barely a mouthful each and that's not value for money.